There are no manuscripts for this title in this collection. Treviso, Italy: Vianello Libri, 1991. 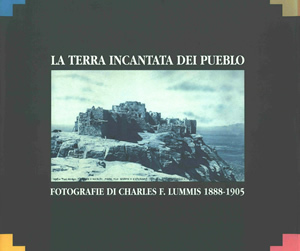 This is La Terra Incantata dei Pueblo, an oversize hardcover book of photographs by Charles F. Lummis. Published in 1991 by Vianello Libri, the text is in Italian with English versions at the back. Translation to Italian was done by Mario Materassi and Claudia Costa. The book's graphic design is by Bordini & Faccini Associati with layout by Luca Faccini. This is an oversize hardcover book with dust jacket and clear plastic cover. The front cover features an 1891 photograph of Hualpi (Walpi), a Hopi village established around 900 CE in northern Arizona. The back cover and fold-outs are plain black with colored block design elements at the corners. The inside front and back covers display a map of Pueblo and other locations in Arizona and New Mexico, printed in shades of orange, brown and blue. Format: Hardcover, 28.5 x 28.5 cm. Binding: Full-color vinyl-covered boards. On the spine, the title and photographer credit are printed bottom to top horizontally in white on a black background. The publisher logo is printed vertically at the bottom of the spine on a yellow background.